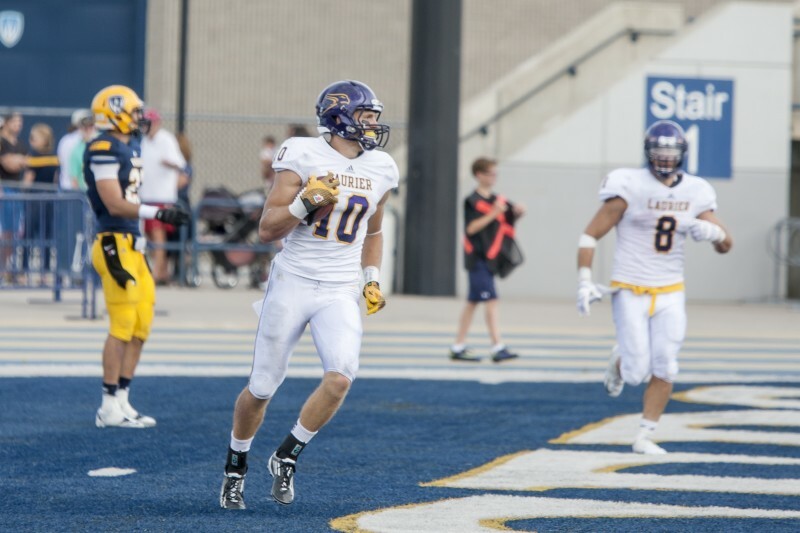 Wilfrid Laurier University men’s football quarterback James Fracas, alongside fourth-year receiver Greg Nyhof and third-year defensive linemen Anthony Petrucci got the opportunity to compete against top caliber players from across the country at the annual East-West Bowl. Laurier bench boss Michael Faulds, along with assistant coaches Mark Surya, Dwayne Cameron and Irv Daymond, also got invited to coach for Team West. The weeklong event pits Canada’s top university football players against each other, starting with a combine and following up with 1-on-1 drills and practices and team bonding, giving athletes the chance to hone their skills in preparation for the big climatic game at the end of the week. But it’s not just about the game. Sure, the East-West Bowl was a golden opportunity for Fracas, Petrucci and Nyhof to showcase their skills in front of CFL scouts as they head into their eligibility year. But it’s more than just a game that showcases top talent stretching from coast to coast. “It’s a bit of a confidence builder for the players that get to go. They already know they are good skill-wise, and when they go a full week competing against other top players in the country, then they really leave with a sense of confidence,” head coach Michael Faulds said. Many players took away different things from the experience. For Fracas, he focused on building tradition and representation; not just for himself, but also bringing the brand of Laurier football to Montreal. “I really think that it’s not just me, but also the three Laurier guys, really to perform well, try to farther the Laurier football image out in the CIS landscape right? It’s really great to be able to perform, to, foster a name for Laurier football. Last year, having Chris [Ackie], Ese [Mrabure-Ajufo], Dillon [Campbell] all going, we wanted to carry on that tradition of pretty strong football players,” the starting quarterback said. According to Nyhof, although all players took the train from Toronto together, there was a clear divide between athletes who played for their respective schools upon travelling to Montreal. “There’s a group of three Laurier guys sitting together, and there’s a group of four Western guys, and three Mac guys sitting together. It’s funny because we’re just kind of looking at each other, we all know we’re going to the same place and we all know we’re going to be on the same team, but there’s still that hesitation,” he said. But this didn’t last long. By the end of the week, Nyhof felt the competitive boundaries of the Ontario University Athletics conference were overpowered by a sense of camaraderie — despite only playing with each other for a few days. “We still view each other as opponents, but I thought it was really cool that by the end of the week, when you’re in two day practices, and we get to the dog days towards the end of the week and it’s hot and you know we’re all working hard and competing for the same thing that the level of camaraderie that [it] brings is enough to overcome the competitive boundaries we play in the OUA,” Nyhof said.